Prompt: Today's Write The Book prompt was inspired by the interview you heard today with Mary McGarry Morris, who says that when she's developing a character, she tries to think the way that character thinks and have empathy for that person, no matter how different he or she may be from herself. This week's prompt, then, is to think of someone VERY unlike yourself. How would you represent that person's character? What sorts of thoughts might you have? How would you speak? What might you be afraid of? What might you desire? Who would you like or dislike? What secrets might YOU be trying to hide? Stay open to that person's perspective, no matter how strange or violent or dishonorable or meek. Maintaining empathy for the full range of human possibility will benefit the development of your character in the long run. Good luck with this exercise and please listen next week for another! Interview with the poet Clare Rossini. Prompt: Today’s Write The Book Prompt is inspired by the interview you heard today. Clare Rossini’s poem “BIOLOGY LAB, ST. JOSEPH’S SCHOOL FOR GIRLS” concerned just that, a biology class at a Catholic high school for girls. Your prompt for this week, then, is to take that inspiration as a point of departure. Choose a subject: math, biology, English, chemistry, gym, Spanish or French or Latin. Do you remember sitting in that classroom? What did it look like? What did the teacher act like? Who sat next to you – your best friend, or someone you didn’t much like? Did the class inspire you? Did you look forward to it? Why or why not? Write a poem or a scene, using these memories as inspiration. Be sure to include sensory details in the piece. Try to write in such a way that the reader will know just what it felt like to sit, for example, in Mr. Wong’s algebra class as he shot a rubber band at you after you misstated the quadratic formula. Interview with Sue William Silverman, author of Because I Remember Terror, Father, I Remember You; Love Sick: One Woman's Journey Through Sexual Addiction; and the new book, Fearless Confessions: A Guide to Writing Memoir. 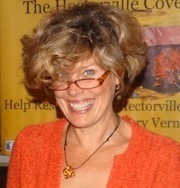 Interview with Vermont Children's Novelist Marilyn Taylor McDowell. Today’s Write The Book Prompt was inspired by my guest, Marilyn Taylor McDowell, who says writers should never edit out the truth. Susan Sontag once wrote, “Literature is a form of responsibility—to literature itself and to society. … a great writer of fiction, by writing truthfully about the society in which she or he lives, cannot help but evoke … the better standards of justice and of truthfulness which we have the right (some would say the duty) to militate for in the necessarily imperfect societies in which we live.” As you write this week, try to keep these thoughts present, if loosely, in your mind. What am I examining in my work? And what is the truth of that condition? Don’t force a lesson or a moral into your writing, but identify the truth, as you believe it exists, and maintain it within the work. Good luck with this prompt, and please listen next week for another.